The plant Cannabis sativa L. has been used as an herbal remedy for centuries and is the most important source of phytocannabinoids. The endocannabinoid system (ECS) consists of receptors, endogenous ligands (endocannabinoids) and metabolizing enzymes, and plays an important role in different physiological and pathological processes. Phytocannabinoids and synthetic cannabinoids can interact with the components of ECS or other cellular pathways and thus affect the development/progression of diseases, including cancer. In cancer patients, cannabinoids have primarily been used as a part of palliative care to alleviate pain, relieve nausea and stimulate appetite. In addition, numerous cell culture and animal studies showed antitumor effects of cannabinoids in various cancer types. Here we reviewed the literature on anticancer effects of plant-derived and synthetic cannabinoids, to better understand their mechanisms of action and role in cancer treatment. We also reviewed the current legislative updates on the use of cannabinoids for medical and therapeutic purposes, primarily in the EU countries. In vitro and in vivo cancer models show that cannabinoids can effectively modulate tumor growth, however, the antitumor effects appear to be largely dependent on cancer type and drug dose/concentration. Understanding how cannabinoids are able to regulate essential cellular processes involved in tumorigenesis, such as progression through the cell cycle, cell proliferation and cell death, as well as the interactions between cannabinoids and the immune system, are crucial for improving existing and developing new therapeutic approaches for cancer patients. The national legislation of the EU Member States defines the legal boundaries of permissible use of cannabinoids for medical and therapeutic purposes, however, these legislative guidelines may not be aligned with the current scientific knowledge. Touw M. The religious and medicinal uses of cannabis in China, India and Tibet. J Psychoactive Drugs 1981;13(1):23-34. https://doi.org/10.1080/02791072.1981.10471447. Robinson SM, Adinoff, B. The classification of substance use disorders: Historical, contextual, and conceptual considerations. Behav Sci (Basel) 2016;6(3):18. https://doi.org/10.3390/bs6030018. Zuardi AW. History of cannabis as a medicine: A review. Rev Bras Psiquiatr 2006;28(2):153-7. https://doi.org/10.1590/S1516-44462006000200015. American Herbal Pharmacopoeia® [Internet]. Scotts Valley: American Herbal Pharmacopoeia®; 2018 [cited 2018 May 30]. Available from: http://www.herbal-ahp.org/. Bifulco M, Pisanti S. Medicinal use of cannabis in Europe: The fact that more countries legalize the medicinal use of cannabis should not become an argument for unfettered and uncontrolled use. EMBO Rep 2015;16(2):130-2. https://doi.org/10.15252/embr.201439742. Ko GD, Bober SL, Mindra S, Moreau JM. Medical cannabis - The Canadian perspective. J Pain Res 2016;9:735-44. https://doi.org/10.2147/JPR.S98182. Birdsall SM, Birdsall TC, Tims LA. The use of medical marijuana in cancer. Curr Oncol Rep 2016;18(7):40. https://doi.org/10.1007/s11912-016-0530-0. Davis MP. Cannabinoids for symptom management and cancer therapy: The evidence. J Natl Compr Canc Netw 2016;14(7):915-22. https://doi.org/10.6004/jnccn.2016.0094. National Cancer Institute [Internet]. USA: National Cancer Institute; 2018 [cited 2018 May 30]. Available from: https://www.cancer.gov/about-cancer/understanding/statistics. Munson AE, Harris LS, Friedman MA, Dewey WL, Carchman RA. Antineoplastic activity of cannabinoids. J Natl Cancer Inst 1975;55(3):597-602. https://doi.org/10.1093/jnci/55.3.597. Müller L, Radtke A, Decker J, Koch M, Belge G. The synthetic cannabinoid Win 55,212-2 elicits in human cancer cell lines. Anticancer Res 2017;37(11):6341-5. https://doi.org/10.21873/anticanres.12086. Pertwee RG. Pharmacology of cannabinoid CB1 and CB2 receptors. Pharmacol Ther 1997;74(2):129-80. https://doi.org/10.1016/S0163-7258(97)82001-3. Devane WA, Hanus L, Breuer A, Pertwee RG, Stevenson LA, Griffin G, et al. Isolation and structure of a brain constituent that binds to the cannabinoid receptor. Science 1992;258(5090):1946-9. https://doi.org/10.1126/science.1470919. Devane WA, Dysarz FA 3rd, Johnson MR, Melvin LS, Howlett AC. Determination and characterization of a cannabinoid receptor in rat brain. Mol Pharmacol 1988;34(5):605-13. Munro S, Thomas KL, Abu-Shaar M. Molecular characterization of a peripheral receptor for cannabinoids. Nature 1993;365(6441):61-5. https://doi.org/10.1038/365061a0. McKinney MK, Cravatt BF. Structure and function of fatty acid amide hydrolase. Annu Rev Biochem 2005;74:411-32. https://doi.org/10.1146/annurev.biochem.74.082803.133450. Guindon J, Hohmann AG. The endocannabinoid system and pain. CNS Neurol Disord Drug Targets 2009;8(6):403-21. https://doi.org/10.2174/187152709789824660. Nadolska K, Gos R. The role of endocannabinoid system in physiological and pathological processes in the eye. [Article in Polish]. Klin Oczna 2008;110(10-12):392-6. Fogli S, Breschi MC. The molecular bases of cannabinoid action in cancer. Cancer Therapy 2008;6:103-16. Javid FA, Phillips RM, Afshinjavid S, Verde R, Ligresti A. Cannabinoid pharmacology in cancer research: A new hope for cancer patients? Eur J Pharmacol 2016;775:1-14. https://doi.org/10.1016/j.ejphar.2016.02.010. Skosnik PD, Cortes-Briones JA, Hajos M. It's all in the rhythm: The role of cannabinoids in neural oscillations and psychosis. Biol Psychiatry 2016;79(7):568-77. https://doi.org/10.1016/j.biopsych.2015.12.011. Console-Bram L, Marcu J, Abood ME. Cannabinoid receptors: Nomenclature and pharmacological principles. Prog Neuropsychopharmacol Biol Psychiatry 2012;38(1):4-15. https://doi.org/10.1016/j.pnpbp.2012.02.009. Brown AJ. Novel cannabinoid receptors. Br J Pharmacol 2007;152(5):567-75. https://doi.org/10.1038/sj.bjp.0707481. Morice AH, Geppetti P. Cough. 5: The type 1 vanilloid receptor: a sensory receptor for cough. Thorax 2004;59(3):257-8. https://doi.org/10.1136/thx.2003.013482. Latorre JG, Schmidt EB. Cannabis, cannabinoids, and cerebral metabolism: Potential applications in stroke and disorders of the central nervous system. Curr Cardiol Rep 2015;17(9):627. https://doi.org/10.1007/s11886-015-0627-3. De Petrocellis L, Ligresti A, Moriello AS, Allara M, Bisogno T, Petrosino S, et al. Effects of cannabinoids and cannabinoid-enriched Cannabis extracts on TRP channels and endocannabinoid metabolic enzymes. Br J Pharmacol 2011;163(7):1479-94. Fogli S, Nieri P, Chicca A, Adinolfi B, Mariotti V, Iacopetti P, et al. Cannabinoid derivatives induce cell death in pancreatic MIA PaCa-2 cells via a receptor-independent mechanism. FEBS Lett 2006;580(7):1733-9. https://doi.org/10.1016/j.febslet.2006.02.024. Perez-Gomez E, Andradas C, Blasco-Benito S, Caffarel MM, Garcia-Taboada E, Villa-Morales, et al. Role of cannabinoid receptor CB2 in HER2 pro-oncogenic signaling in breast cancer. J Natl Cancer Inst 2015;107(6):djv077. https://doi.org/10.1093/jnci/djv077. Caffarel MM, Andradas C, Mira E, Perez-Gomez E, Cerutti C, Moreno-Bueno G, et al. Cannabinoids reduce ErbB2-driven breast cancer progression through Akt inhibition. Mol Cancer 2010;9:196. https://doi.org/10.1186/1476-4598-9-196. Vercelli C, Barbero R, Cuniberti B, Racca S, Abbadessa G, Piccione F, et al. Transient receptor potential vanilloid 1 expression and functionality in MCF-7 cells: A preliminary investigation. J Breast Cancer 2014;17(4):332-8. https://doi.org/10.4048/jbc.2014.17.4.332. Chung SC, Hammarsten P, Josefsson A, Stattin P, Granfors T, Egevad L, et al. A high cannabinoid CB1 receptor immunoreactivity is associated with disease severity and outcome in prostate cancer. Eur J Cancer 2009;45(1):174-82. https://doi.org/10.1016/j.ejca.2008.10.010. Cipriano M, Haggstrom J, Hammarsten P, Fowler CJ. Association between cannabinoid CB1 receptor expression and Akt signalling in prostate cancer. PLoS One 2013;8(6):e65798. https://doi.org/10.1371/journal.pone.0065798. Velasco G, Hernandez S, Davila D, Lorente M. The use of cannabinoids as anticancer agents. Prog Neuropsychopharmacol Biol Psychiatry 2016;64:259-66. https://doi.org/10.1016/j.pnpbp.2015.05.010. Thors L, Bergh A, Persson E, Hammarsten P, Stattin P, Egevad L, et al. Fatty acid amide hydrolase in prostate cancer: Association with disease severity and outcome, CB1 receptor expression and regulation by IL-4. PLoS One 2010;5(8):e12275. https://doi.org/10.1371/journal.pone.0012275. Sarfaraz S, Adhami VM, Syed DN, Afaq F, Mukhtar H. Cannabinoids for cancer treatment: Progress and promise. Cancer Res 2008;68(2):339-42. Orellana-Serradell O, Poblete CE, Sanchez C, Castellon EA, Gallegos I, Huidobro C, et al. Proapoptotic effect of endocannabinoids in prostate cancer cells. Oncol Rep 2015;33(4):1599-1608. https://doi.org/10.3892/or.2015.3746. Sanchez MG, Sanchez AM, Collado B, Malagarie-Cazenave S, Olea N, Carmena MJ, et al. Expression of the transient receptor potential vanilloid 1 (TRPV1) in LNCaP and PC-3 prostate cancer cells and in human prostate tissue. Eur J Pharmacol 2005;515(1-3):20-7. https://doi.org/10.1016/j.ejphar.2005.04.010. Pecze L, Josvay K, Blum W, Petrovics G, Vizler C, Olah Z, et al. Activation of endogenous TRPV1 fails to induce overstimulation-based cytotoxicity in breast and prostate cancer cells but not in pain-sensing neurons. Biochim Biophys Acta 2016;1863(8):2054-64. https://doi.org/10.1016/j.bbamcr.2016.05.007. De Petrocellis L, Ligresti A, Schiano Moriello A, Iappelli M, Verde R, Stott CG, et al. Non-THC cannabinoids inhibit prostate carcinoma growth in vitro and in vivo: Pro-apoptotic effects and underlying mechanisms. Br J Pharmacol 2013;168(1):79-102. Pineiro R, Maffucci T, Falasca M. The putative cannabinoid receptor GPR55 defines a novel autocrine loop in cancer cell proliferation. Oncogene 2011;30(2):142-52. https://doi.org/10.1038/onc.2010.417. Mukhopadhyay B, Schuebel K, Mukhopadhyay P, Cinar R, Godlewski G, Xiong K, et al. Cannabinoid receptor 1 promotes hepatocellular carcinoma initiation and progression through multiple mechanisms. Hepatology 2015;61(5):1615-26. https://doi.org/10.1002/hep.27686. Xu X, Liu Y, Huang S, Liu G, Xie C, Zhou J, et al. Overexpression of cannabinoid receptors CB1 and CB2 correlates with improved prognosis of patients with hepatocellular carcinoma. Cancer Genet Cytogenet 2006;171(1):31-8. https://doi.org/10.1016/j.cancergencyto.2006.06.014. Preet A, Qamri Z, Nasser MW, Prasad A, Shilo K, Zou X, et al. Cannabinoid receptors, CB1 and CB2, as novel targets for inhibition of non-small cell lung cancer growth and metastasis. Cancer Prev Res (Phila) 2011;4(1):65-75. https://doi.org/10.1158/1940-6207.CAPR-10-0181. Freund P, Porpaczy EA, Le T, Gruber M, Pausz C, Staber P, et al. Cannabinoid receptors are overexpressed in CLL but of limited potential for therapeutic exploitation. PLoS One 2016;11(6): e0156693. https://doi.org/10.1371/journal.pone.0156693. Michalski CW, Oti FE, Erkan M, Sauliunaite D, Bergmann F, Pacher P, et al. Cannabinoids in pancreatic cancer: Correlation with survival and pain. Int J Cancer 2008;122(4):742-50. https://doi.org/10.1002/ijc.23114. Chakravarti B, Ravi J, Ganju RK. Cannabinoids as therapeutic agents in cancer: Current status and future implications. Oncotarget 2014;5(15):5852-72. https://doi.org/10.18632/oncotarget.2233. Carracedo A, Gironella M, Lorente M, Garcia S, Guzman M, Velasco G, et al. Cannabinoids induce apoptosis of pancreatic tumor cells via endoplasmic reticulum stress-related genes. Cancer Res 2006;66(13):6748-55. https://doi.org/10.1158/0008-5472.CAN-06-0169. Zhao Z, Yang J, Zhao H, Fang X, Li H. Cannabinoid receptor 2 is upregulated in melanoma. J Cancer Res Ther 2012;8(4):549-54. https://doi.org/10.4103/0973-1482.106534. Malfitano AM, Ciaglia E, Gangemi G, Gazzerro P, Laezza C, Bifulco M. Update on the endocannabinoid system as an anticancer target. Expert Opin Ther Targets 2011;15(3):297-308. https://doi.org/10.1517/14728222.2011.553606. Nomura DK, Long JZ, Niessen S, Hoover HS, Ng SW, Cravatt BF. Monoacylglycerol lipase regulates a fatty acid network that promotes cancer pathogenesis. Cell 2010;140(1):49-61. https://doi.org/10.1016/j.cell.2009.11.027. Velasco G, Sanchez C, Guzman M. Endocannabinoids and cancer. Handb Exp Pharmacol 2015;231:449-72. https://doi.org/10.1007/978-3-319-20825-1_16. Guzman M. Cannabinoids: Potential anticancer agents. Nat Rev Cancer 2003;3(10):745-55. https://doi.org/10.1038/nrc1188. 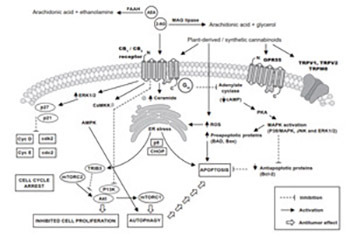 Demuth DG, Molleman A. Cannabinoid signalling. Life Sci 2006;78(6):549-63. https://doi.org/10.1016/j.lfs.2005.05.055. Velasco G, Sanchez C, Guzman M. Anticancer mechanisms of cannabinoids. Curr Oncol 2016;23(Suppl 2):S23-S32. https://doi.org/10.3747/co.23.3080. Caffarel MM, Andradas C, Perez-Gomez E, Guzman M, Sanchez C. Cannabinoids: A new hope for breast cancer therapy? Cancer Treat Rev 2012;38(7):911-8. https://doi.org/10.1016/j.ctrv.2012.06.005. Andre CM, Hausman JF, Guerriero G. Cannabis sativa: The plant of the thousand and one molecules. Front Plant Sci 2016;7:19. https://doi.org/10.3389/fpls.2016.00019. Romano B, Pagano E, Orlando P, Capasso R, Cascio MG, Pertwee R, et al. Pure delta9-tetrahydrocannabivarin and a Cannabis sativa extract with high content in delta9-tetrahydrocannabivarin inhibit nitrite production in murine peritoneal macrophages. Pharmacol Res 2016;113(Pt A):199-208. https://doi.org/10.1016/j.phrs.2016.07.045. Showalter VM, Compton DR, Martin BR, Abood ME. Evaluation of binding in a transfected cell line expressing a peripheral cannabinoid receptor (CB2): Identification of cannabinoid receptor subtype selective ligands. J Pharmacol Exp Ther 1996;278(3):989-99. Izzo AA, Borrell, F, Capasso R, Di Marzo V, Mechoulam R. Non-psychotropic plant cannabinoids: New therapeutic opportunities from an ancient herb. Trends Pharmacol Sci 2009;30(10):515-27. https://doi.org/10.1016/j.tips.2009.07.006. Grotenhermen F, Muller-Vahl K. The therapeutic potential of cannabis and cannabinoids. Dtsch Arztebl Int 2012;109(29-30):495-501. https://doi.org/10.3238/arztebl.2012.0495. Hong S, Sowndhararajan K, Joo T, Lim C, Cho H, Kim S, et al. Ethanol and supercritical fluid extracts of hemp seed (Cannabis sativa L.) increase gene expression of antioxidant enzymes in HepG2 cells. Asian Pac J Reprod 2015;4(2):147-52. McAllister SD, Soroceanu L, Desprez PY. The antitumor activity of plant-derived non-psychoactive cannabinoids. J Neuroimmune Pharmacol 2015;10(2):255-67. https://doi.org/10.1007/s11481-015-9608-y. Cridge BJ, Rosengren RJ. Critical appraisal of the potential use of cannabinoids in cancer management. Cancer Manag Res 2013;5:301-13. https://doi.org/10.2147/CMAR.S36105. Hart S, Fischer OM, Ullrich A. Cannabinoids induce cancer cell proliferation via tumor necrosis factor alpha-converting enzyme (TACE/ADAM17)-mediated transactivation of the epidermal growth factor receptor. Cancer Res 2004;64(6):1943-50. Shrivastava A, Kuzontkoski PM, Groopman JE, Prasad A. Cannabidiol induces programmed cell death in breast cancer cells by coordinating the cross-talk between apoptosis and autophagy. Mol Cancer Ther 2011;10(7):1161-72. https://doi.org/10.1158/1535-7163.MCT-10-1100. Solinas M, Massi P, Cinquina V, Valenti M, Bolognini D, Gariboldi M, et al. Cannabidiol, a non-psychoactive cannabinoid compound, inhibits proliferation and invasion in U87-MG and T98G glioma cells through a multitarget effect. PLoS One 2013;8(10):e76918. https://doi.org/10.1371/journal.pone.0076918. Sharma M, Hudson J, Adomat H, Guns E, Cox M. In vitro anticancer activity of plant-derived cannabidiol on prostate cancer cell lines. Pharmacol Pharm 2014;5(8):806-20. https://doi.org/10.4236/pp.2014.58091. Marcu JP, Christian RT, Lau D, Zielinski AJ, Horowitz MP, Lee J, et al. Cannabidiol enhances the inhibitory effects of delta9-tetrahydrocannabinol on human glioblastoma cell proliferation and survival. Mol Cancer Ther 2010;9(1):180-9. https://doi.org/10.1158/1535-7163.MCT-09-0407. Nagarkatti P, Pandey R, Rieder SA, Hegde VL, Nagarkatti M. Cannabinoids as novel anti-inflammatory drugs. Future Med Chem 2009;1(7):1333-49. https://doi.org/10.4155/fmc.09.93. McKallip RJ, Nagarkatti M, Nagarkatti PS. Δ-9-tetrahydrocannabinol enhances breast cancer growth and metastasis by suppression of the antitumor immune response. J Immunol 2005;174(6):3281-9. https://doi.org/10.4049/jimmunol.174.6.3281. Zhu LX, Sharma S, Stolina M, Gardner B, Roth MD, Tashkin DP, et al. Δ-9-tetrahydrocannabinol inhibits antitumor immunity by a CB2 receptor-mediated, cytokine-dependent pathway. J Immunol 2000;165(1):373-80. https://doi.org/10.4049/jimmunol.165.1.373. Hanlon KE, Lozano-Ondoua AN, Umaretiya PJ, Symons-Liguori AM, Chandramouli A, Moy JK, et al. Modulation of breast cancer cell viability by a cannabinoid receptor 2 agonist, JWH-015, is calcium dependent. Breast Cancer (Dove Med Press) 2016;8:59-71. https://doi.org/10.2147/BCTT.S100393. Castaneto MS, Gorelick DA, Desrosiers NA, Hartman RL, Pirard S, Huestis MA. Synthetic cannabinoids: Epidemiology, pharmacodynamics, and clinical implications. Drug Alcohol Depend 2014;144:12-41. https://doi.org/10.1016/j.drugalcdep.2014.08.005. Debruyne D, Le Boisselier R. Emerging drugs of abuse: Current perspectives on synthetic cannabinoids. Subst Abuse Rehabil 2015;6:113-29. https://doi.org/10.2147/SAR.S73586. Guzman M, Sanchez C, Galve-Roperh I. Cannabinoids and cell fate. Pharmacol Ther 2002;95(2):175-84. https://doi.org/10.1016/S0163-7258(02)00256-5. Otrubova K, Ezzili C, Boger DL. The discovery and development of inhibitors of fatty acid amide hydrolase (FAAH). Bioorg Med Chem Lett 2011;21(16):4674-85. https://doi.org/10.1016/j.bmcl.2011.06.096. Ravi J, Sneh A, Shilo K, Nasser MW, Ganju RK. FAAH inhibition enhances anandamide mediated anti-tumorigenic effects in non-small cell lung cancer by downregulating the EGF/EGFR pathway. Oncotarget 2014;5(9):2475-86. https://doi.org/10.18632/oncotarget.1723. Winkler K, Ramer R, Dithmer S, Ivanov I, Merkord J, Hinz B. Fatty acid amide hydrolase inhibitors confer anti-invasive and antimetastatic effects on lung cancer cells. Oncotarget 2016;7(12):15047-64. https://doi.org/10.18632/oncotarget.7592. Kaur R, Sidhu P, Singh S. What failed BIA 10-2474 phase I clinical trial? Global speculations and recommendations for future Phase I trials. J Pharmacol Pharmacother 2016;7(3):120-6. https://doi.org/10.4103/0976-500X.189661. June 1 [cited on: 2018 May 30]. Available from: http://selections.rockefeller.edu/the-price-of-mistakes-in-clinical-trials/. U.S. National Library of Medicine [Internet]. Bethesda: U.S. National Library of Medicine; 2018 [cited on: 2018 May 30]. Available from: https://www.clinicaltrials.gov/ct2/show/NCT00981357. U.S. National Library of Medicine [Internet]. Bethesda: U.S. National Library of Medicine; 2018 [cited on: 2018 May 30]. Available from: https://www.clinicaltrials.gov/ct2/show/NCT01748695. Slovenia. International Treaties. Act notifying the succession of the Republic of Slovenia to United Nations conventions and conventions adopted by the International Atomic Energy Agency. No 9/92. Ljubljana: Ministry of Justice; 1992. Čufar A. Prescribing of cannabinoids – A regulatory view. Pharmaceutical Journal of Slovenia 2016;67:91-5. European Union. Directive 2001/83/EC of the European Parliament and of the Council of 6 November 2001 on the Community code relating to medicinal products for human use. Brussels: European Parliament; 2011. Slovenia. Production of and Trade in Illicit Drugs Act. No 47/04. Ljubljana: Ministry of Justice; 2004. Slovenia. Act Regulating the Prevention of the Use of Illicit Drugs and the Treatment of Drug Users. No 2/04. Ljubljana: Ministry of Justice; 2004. Slovenia. Criminal Code of the Republic of Slovenia. No 38/2016. Ljubljana: Ministry of Justice; 2016. Slovenia. Decree on the classification of illicit drugs. No 14/2017. Ljubljana: Ministry of Justice; 2017. Slovenia. Rules on method and form of record-keeping and of reports on illicit drugs. No 131/2006. Ljubljana: Ministry of Justice; 2006. Slovenia. Rules governing the procedures for the issue of licenses for illicit drugs marketing. No 8/2002. Ljubljana: Ministry of Justice; 2002. Slovenia. Decree amending the Decree on the classification of illicit drugs. No 14/2017. Ljubljana: Ministry of Justice; 2017. Slovenia. Medicinal Products Act. No 17/2014. Ljubljana: Ministry of Health; 2014. Slovenia. Pharmacy Services Act. No 85/2016. Ljubljana: Ministry of Health; 2016.